One of the great things about B2B marketing is there is endless potential for generating interesting content for your audience. Marketers have to constantly be aware of what the next big thing is and if that big thing is worth our time and money. I think we can all agree that tools to help create cool and creative content is worth looking at, especially if that content format has proven successful time and time again. Ok, Rookie, what’s your point? 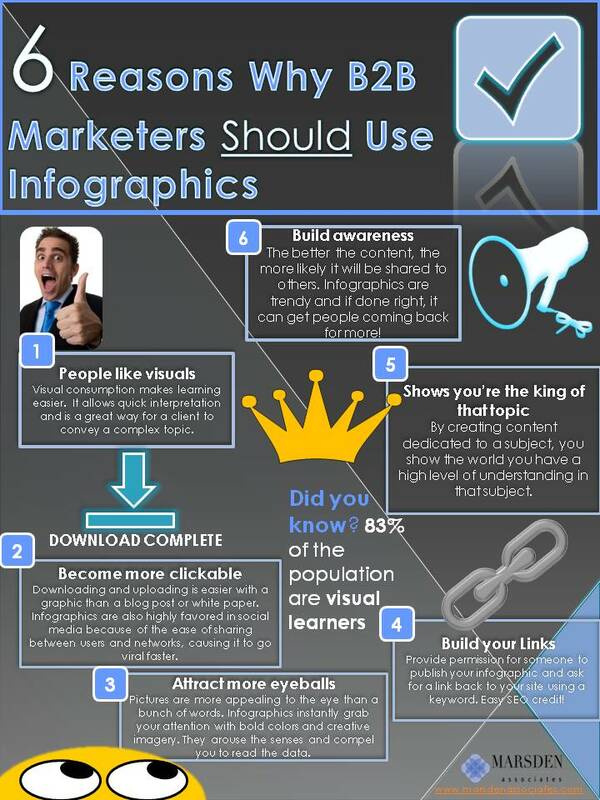 Infographics is that new, interesting style to create and display your content. Information graphic or infographics are graphic, visual representations of information, data or knowledge. These particular graphics are popular because they present complex information quickly and clearly. And given that 65% of the population are visual learners (including myself), infographics can easily be successful. 1. People connect with visuals. Visual consumption makes learning easier. In fact, the brain processes visual information 60,000x faster than text. Visuals allow quick interpretation. This would be great way for a client to convey a complex topic. Downloading and uploading is easier with a graphic than a blog post or white paper. Infographics are also highly favored in social media because of the ease of sharing between users and networks, causing it to go viral faster. Let’s face it, pictures are more appealing than something written. It’s content eye candy! The nature of an infographic is to instantly grab your attention with bold colors and creative imagery. These elements arouse the senses and encourage further reading of the text. 4. Great for link building. Infographics are great ways to build links. Someone could publish your content and you could ask for a link back to your site with a particular keyword. Google will index your website higher and it will gain importance to search engines. 5. Shows an expert knowledge of a subject. By creating content dedicated to a particular topic, you show the world you high level of understanding of that topic. You could be viewed as an expert in that topic. 6. Builds awareness and traffic. Every marketer knows that content creation is important to build hype around your company. The better the content, the more likely it will be shared to others. Infographics are trendy and if done right, it can get people coming back for more! Are you convinced? If so, here’s an infographic inspiration website called Visual.ly full of nifty ideas to get those creative juices flowing. Be careful, though. It’s highly addictive. Infographic agencies charge between $2k and $5k to research, design and promote a companies infographic. HubSpot provided a blog post on how to make infographics in PowerPoint, which is a lot less costly if you have a creative eye and can work your magic around PowerPoint. Keep in mind that research, eye-popping design and promotion are all necessary to get the most out of your infographic, but it’s the big picture that will make it sink or swim. I recently created an infographic for Marsden & Associates that showed 10 Ways To Krank Up Your Klout. A million ideas ran through my head, but I had to remind myself what the purpose of an infographic was and what B2B marketers are asking questions about in the realm of inbound marketing. Once you have that, you will be unstoppable! If you’re interested in implementing infographics into your inbound marketing strategy, feel free to contact Marsden & Associates and we can get you started!